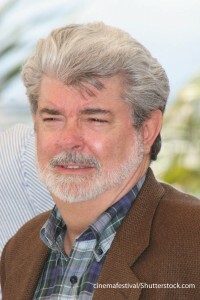 George Lucas- "You have to find something that you love enough to be able to take risks, jump over hurdles and break through the brick walls that are always going to be placed in front of you." Part of the issue of achievement is to be able to set realistic goals, but that’s one of the hardest things to do because you don’t always know exactly where you’re going, and you shouldn’t. Talent is a combination of something you love a great deal, something you can lose yourself in – something that you can start at 9 in the morning, look up from your work and it’s 10 o’clock at night – and something that you have a natural ability to do very well. Once I started in that department, I found what it was that I loved and was good at. And I realized I could do it very well, and that I enjoyed doing it. It really ignited a passion in me, and it took off from there. I’m extremely grateful that I discovered my passion. I love movies. I love to watch them, I love to make them. We want to succeed but we don’t want anybody else to succeed, because we want to be the winner. Once you get that mentality – which is unfortunately the way a lot of the society operates – you lose. It’s hard work making movies… if you don’t really love it, then it ain’t worth it. That’s the key to it. To have everybody succeed, not to gloat over somebody else’s failure…if you do that all the time, it helps you personally. But it’s a good business decision. The best way to pursue happiness is to help other people. Because there’s nothing else that will make you happier. The secret is not to give up hope. It’s very hard not to because if you’re really doing something worthwhile I think you will be pushed to the brink of hopelessness before you come through the other side. You just have to hang in through that. I thought it (Star Wars) was too wacky for the general public. Right or wrong this is my movie, this is my decision, and this is my creative vision, and if people don’t like it, they don’t have to see it. I’m able to tell the story the way it’s meant to be told, and I don’t have to listen to what studio market research does. Whatever has happened in my quest for innovation has been part of my quest for immaculate reality. I’ve worked hard enough and earned enough to fail for the rest of my life. And I’m going to do it. I’ve seen again a lot of people go through this life, who are working so hard, they wake up one day and realize that those things that they said, “I’ll do that someday, I’ll do that someday”, well, that someday is today. I am simply trying to struggle through life; trying to do God’s bidding. My teenage years were completely devoted to cars. That was the most important thing in my life, from about the age of 14 to 20. When I first got to college, I was very interested in the social sciences, anthropology, sociology, psychology, those kinds of things. And I was still interested in art and photography. I didn’t know that I could actually put them all together in one occupation and love it. Suddenly everything came together in one place. All my likes, everything I actually seemed to have talent for was right there. After that, I didn’t do anything but films. I put all of my resources into pushing the evolution in an industry that is notoriously backwards and I enjoy pushing the envelope. I used to do it with cars, then I did it with film, now I do it with the ranch. My first six years in the business were hopeless. There are a lot of times when you sit and you say “Why am I doing this? I’ll never make it. It’s just not going to happen. I should go out and get a real job and try to survive”. It’s just a matter of moving around until you’ve discovered what it is. I’m lucky enough that there is never a blank canvas in front of me…I have hundreds of projects that I want to do but I am running out of time. I don’t think, as a craftsman, that my films are extremely well made. They’re kind of crude. I’m not that keen on technology. I’m a storyteller, but to enable me to tell my stories, I’ve had to develop the necessary technology. A lot of people like to do certain things, but they’re not that good at it. Keep going through the things that you like to do, until you find something that you actually seem to be extremely good at. It’s not a matter of how well can you make a movie. It’s how well can you make it under the circumstances, because there’s always circumstances and you cannot use that as an excuse. Everybody said it was a crazy thing to do because in those days nobody made it into the film business…so everybody was thinking I was silly. I wasn’t moved by that. I set the goal of getting through film school, and just then focused on getting to that level. You have to have a thick enough skin to cope with criticism. The journalistic community lives in a world of sound bites and literary commerce: selling newspapers, selling books, and they do that simply by trashing things. Technical criticism is extremely helpful but you are only going to get that from your peers. It’s not a business. It’s trying to create something interesting that you’re proud of, and try out creative ideas that may seem really off the wall, may work or may not work. With each film, I pushed the envelope of technology. We were having a lot of problems. It’s very hard to do special effects and create those illusions and it was obvious right from the start that being able to use digital technology to create those illusions would be a huge advance and make things much more facile. I knew that if we could advance the world of special effects, we could do more kinds of movies. I got the licensing rights because I figured they wouldn’t promote the film and if I got T-shirts and things out there with the name of the film on them it would help promote the movie. The whole idea that licensing was a revenue stream didn’t really occur to anybody including me. As it turned out, the film was so successful we were able to make toy deals and we began to start the whole idea of action figures, of tie-ins, of toys that go along with movies. It’s all being buried with me. All copies of the two trilogies will be brought to my gravesite within one month of my death and laid to rest with me. Any society begins by realizing that together, by helping each other, you can survive better than if you fight each other and compete with each other. We have the tendency to lose it when we forget that, as a group, we are stronger than we are as individuals. When we were in film school and we were starting in the film business, the door was absolutely locked…all of us beggars and scroungers down at the front gate decided that if we didn’t band together, we wouldn’t survive. If one could make it, that one would help all the others make it. And we would continue to help each other. So we banded together. If I got a job, I would help somebody else get a job. If somebody got more successful than me, it was partly my success. My success wasn’t based on how I could push down everyone around me. My success was based on how much I could push everybody up… And in the process they pushed me up, and I pushed them up, and we kept doing that, and we still do that. I had a different life planned out for me. But then, you know, I had that story sitting there.